How Harvard started a mindfulness program to address staff stress. Not even the ivy halls of Harvard are immune from stress in the workplace. And just like other employers in the US, Harvard University is concerned about the impact of that stress on their employees. When the University’s director of the Office for Work/Life, Nancy Costikyan, was invited to present to senior leaders about stress management for employees she took a deep look at national statistics about stress and depression and their implications for Harvard. According to the American Psychological Association, the annual national survey on stress revealed that chronic stress was becoming a “public health crisis.” As a clinical social worker and teaching associate in psychiatry at the Harvard Medical School, Costikyan was well versed in the high cost of stress. “When I went to the leadership team meeting to brief them on the issue, I emphasized the financial impact of stress in the workplace,” she says. Costikyan didn’t just talk about the potential money Harvard might spend on mental health issues, she looked at what national numbers suggested about the levels of stress in their community, and how that might affect productivity and employee retention. “We are a highly decentralized organization at Harvard, where all of the schools are financially self-sufficient, and have different practices and different cultures.” To address this, Harvard president Drew Faust had recently introduced the idea of “One Harvard.” “We’re always looking for ways to work together and identify as a single entity and mindfulness seemed to be yet another way into a conversation about community,” says Costikyan. “We went into this project very alert to the kind of cynicism that might emerge if we did it badly,” says Costikyan. As the team worked to articulate a narrative around what “mindfulness” and “well-being” meant at Harvard, they realized they needed to approach it with the skeptics in mind. “We went into this project very alert to the kind of cynicism that might emerge if we did it badly,” says Costikyan. In order to make sure they rolled out the program in just the right way for their community, they made an effort to avoid discrepancies between the rhetoric around the initiative and the realities of the workplace. They took a measured approach, and it paid off. “We really wanted to be thoughtful about how we communicated this so that we didn’t overpromise. And we weren’t sure if the demand for the program was going to match what all the benchmarking and research was telling us to expect,” she adds. So in 2012, they launched the program with modest funding, and worked with Tara Healey at Harvard Pilgrim Health Care, who helped them understand how to roll it out based on her experience. The initial program, called Mindfulness At Work, was launched through the Office of Executive Vice President Katie Lapp and offered a 6-week mindfulness course for a total of 7 hours. And what the team discovered was that these courses were filling up as soon as they were being rolled out. “One course filled up within 24 hours of being offered. It was just amazing,” says Costikyan. Of course, not everyone stuck with the program to the end. But the team had an initial goal, over a three-year period, of getting 10% of central administration to go through the course, and they exceeded that goal. Now they’re experimenting with ways to tweak the offerings to attract even more people. “In the initial phase of the program we reached a lot of the people who were already willing to try mindfulness and now we’re trying to reach those who are still contemplating the idea of mindfulness training,” says Costikyan. To reach the skeptics, they’re offering shorter bites of mindfulness (1-hour programs, 90-minute programs), they’re setting up programs in different locations with local sponsors so people don’t have to travel, and they’re creating programs that are tailored to each location’s specific organizational cultures. So, how have the Harvard skeptics reacted to the program? “One of the wonderful surprises for many of us is that we’ve barely heard from any skeptics at all. It doesn’t mean that they’re not skeptical, they just haven’t dominated the conversation,” she explains. 1) Tie it to other institutional priorities. There’s been a global shift in the way organizations have been envisioning sustainable development and sustainability plans, and that shift is in the direction of employee wellbeing, not just of the individual, but of the community that exists within the organization. For example, Harvard’s Sustainability Plan sets specific commitments in the area of health and well-being, and the Office for Sustainability has been a close partner for Costikyan and her team. Mindfulness is proving to be a robust path toward wellbeing for many. 2) Make it about resilience. Don’t stimulate people’s anxiety by making mindfulness practice a monumental task. Mindfulness is a quality of alert, open awareness, in contrast to a multitasking mind. These programs train the mind and allow us to engage in our lives with greater clarity and wisdom. “Usually people walk into the first class thinking, I’m going to learn how to turn off my mind. Surprise! That’s not how it works,” says Costikyan. “And then people are really thrilled to be surprised like that, because they knew deep down that there was no way they would ever be able to turn off their thoughts. To have permission to let that go is very encouraging.” The program should offer skills for people to build on their innate human capabilities. 3) Go into the project mindfully. If you’re truly embodying some of the core principles of mindfulness, then you can’t go into a conversation with a skeptic trying to argue your opponent out of their perspective. “Arguing has limited utility if you’re trying to promote something that is about open, non-judgmental awareness,” says Costikyan. 4) Welcome and embrace the resistance. A mindfulness program is not a one-size-fits-all answer, and every culture is unique. There are real concerns that must be addressed before even considering implementing something like this. Do your best to understand and anticipate what those concerns might be, and then initiate a conversation to address them. 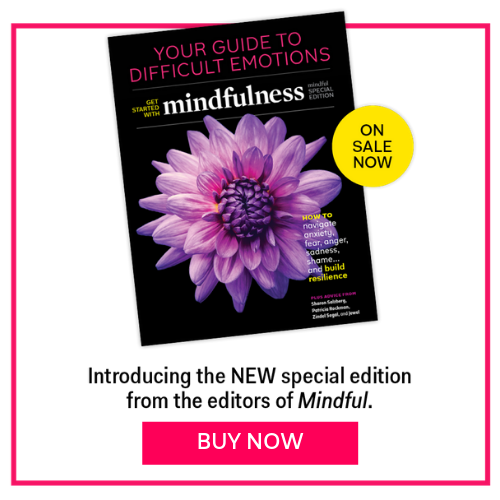 Heather Hurlock is Digital Editor for Mindful. She balances her career with a healthy dose of family life and a few weekends a month fronting an indie folk/barnrock band.